Arby's has built it's reputation and fame from a single item. No, I'm not talking about their roast beef...I'm talking about their sauce. Is Arby's sauce barbeque sauce? Is it more like a vinegary ketchup? Was it the saving manna that led Moses through the desert? I'm not entirely sure, but it sure is delicious. I don't even know why they ask you if you want Arby's sauce with your sandwich when going through the drive-thru. They should ask if you want a sandwich to go with your Arby's sauce. This new sandwich flies into the very face of what Arby's deity created "in the beginning." No hot roast beef, multiple sauces which in theory I wouldn't guess would mix well with Arby's sauce, and pickles. I repeat--pickles on an Arby's roast beef sandwich. Here's the catch though--It's really good. I had them leave the mayo off the sandwich because my clothes are starting to get stretch marks. It wasn't really necessary as the sandwich also has a vinaigrette dressing to complement the roast beef, banana peppers, pickles, Swiss cheese, onions and tomatoes. In addition, the toasted bun gives a good complement to the cool toppings on the sandwich. The only negative would be the price. The sandwich is over 5 dollars by itself, and the combo will run you at least 7 bucks depending on your location. If I spend $7.50 on lunch, I'd like it to be something different than fast food. Did I end up putting Arby's sauce on this sandwich? Yes. It would have been sacrilegious had I not. And it ended up working out quite well. I'd purchase this again. Strong 4-star rating here. 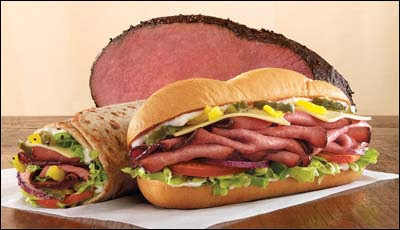 Check back tomorrow--We'll be giving away a 20 dollar gift certificate to Arby's so you can try the new sandwich. Please note--Review Spew received this sandwich for free in order to review this item. Review Spew does not give a positive or negative review based on receiving free items. In fact, we generally enjoy giving negative reviews related to giveaway items. It always seems to piss them off...:) Alas, a negative review does not apply here.